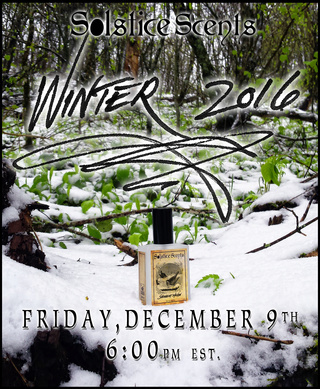 The Winter Collection will go live at 6 p.m. EST tomorrow, December 9th, at www.solsticescents.com Follow us on Instagram @solsticescents and on Facebook at www.solsticescents.net for info and sneak peaks. A list of available products is listed just below. Scroll beyond the list for the full winter collection perfume descriptions. Allow the pictures if you'd like to see any of the images. We will begin shipping all orders from tomorrow night on Saturday. We expect to have all of the orders placed tomorrow shipped out by Tuesday and orders from this weekend on Tuesday and Wednesday. These estimates are approximate but we are basing this guesstimate on previous releases' volume. If you're domestic, you still have plenty of time for Christmas gifts to arrive. We also sell e-gift certificates. 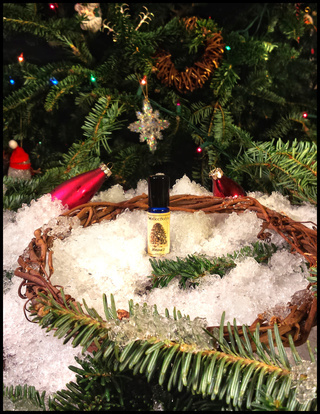 Solstice Scents 5 mls, 2.5 ml EDP sprays and sampler packs make great stocking stuffers and gifts. Lemon Ginger Creams 5 ml perfume oil, Burnishing Glace, Whipped Soap (I'm having trouble sourcing one of the oils for this fragrance and it may be the last year for this exact formula. 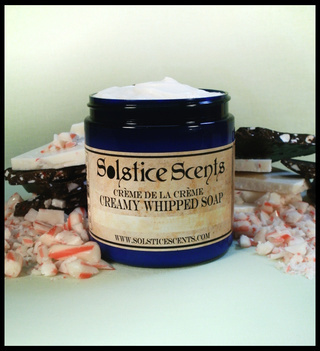 Whipped Soap will not be restocked). 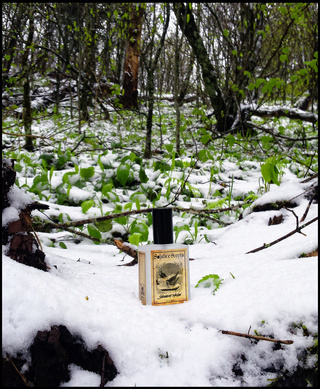 Snowmint Mallow 5 ml perfume oil, 60 ml EDP, 2.5 ml EDP sample and first time in Burnishing Glace! Buttered Rum Mallow smells of spiced rum swirled with marshmallow and brown sugar. This is a very spicy perfume. On cold sniff and initial application, the spiced rum, cardamom and nutmeg are the most prominent notes, followed quickly by the clove. 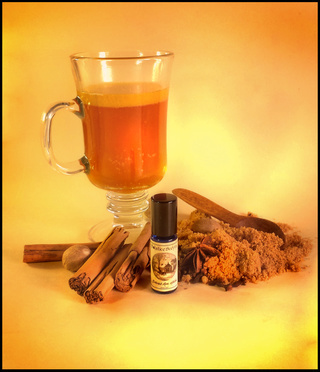 The heavy winter spices and rum are tempered with the butter, brown sugar and marshmallow and this fragrance will become a bit sweeter the longer it is on the skin. It evokes the mood of being snuggled in a warm sweater, curled up with a hot mug of your favorite holiday drink in the presence of a roaring fire while everyone is asleep and inches of snow blanket the ground outside. Buttered Rum Mallow is a gourmand blend at the core but it is really dark, sophisticated and rich as well. This is a gourmand fragrance unlike the sweeter cake and mallow counterparts and may be one men will also enjoy. Creamy milk chocolate bark studded with crushed cool peppermint candies, drizzled with a touch of dark and white chocolates. Blooms wonderfully in the shower. 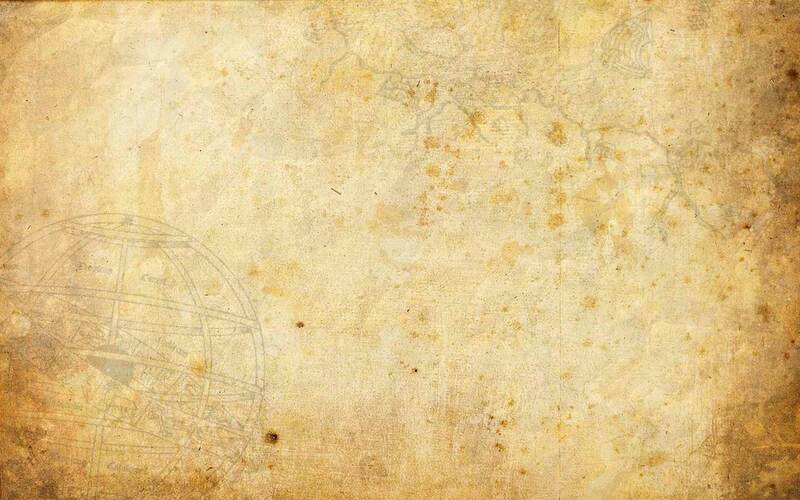 Flintlock is an intensely dark, woody, smokey and slightly coniferous blend. 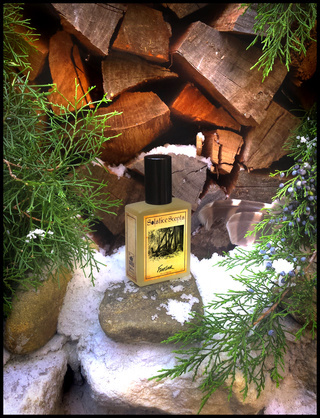 It is a combination of worn brown saddle leather, Virginia cedarwood, tobacco absolute, black pepper, sandalwood and a medley of other woods with a touch of evergreens, bayberry and smoke that will plunge you deep into a Pioneer's winter in the American frontier. Flintlock is darker on cold sniff and initial application than on the dry down. The evergreen and bayberry notes are very mild and primarily detectable at this stage in the opening. The blend wears like a warm brown leather jacket infused with cedar and smoke. It is woody, smoky and refined on the dry down. (I'm having trouble sourcing one of the oils for this fragrance and it may be the last year for this exact formula. Whipped Soap will not be restocked). Vanilla cream filling infused with loads of bright lemon and sandwiched in between two perfectly spicy gingersnap cookies. On cold sniff and initial application the lemon cream filling is sweet and tart tempered by the vanilla blend. The gingersnap cookies are the perfect blend of ginger and cinnamon and pair wonderfully with the citrusy sweet-cream filling. This fragrance is uplifting and comforting. The lemon will soften after some time on the skin as the vanilla cream filling becomes more prominent in the dry down. 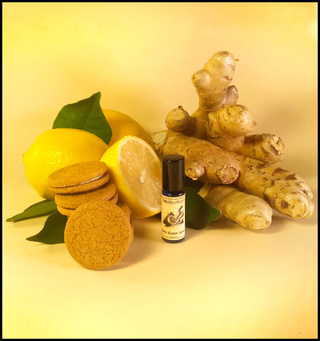 Lemon Ginger Creams contains real ginger essential oil that smells incredible. After an hour or so of wear, Lemon Ginger Creams turns into a soft vanilla cream filling scent with only a faint trace of lemon and gingersnap. A beacon of light amidst cold, desolate wilderness. Pass through a copse of young evergreens into a warm cedar cabin and thaw out under a soft Afghan blanket by a blazing fire while sugared treats from the kitchen fill the air. 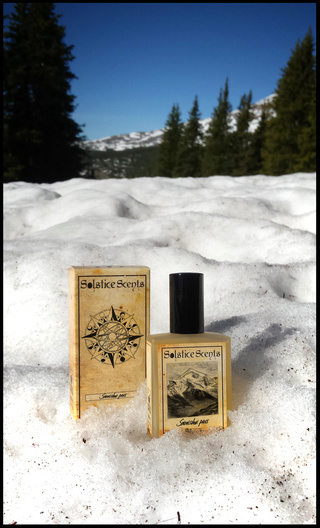 Notes include sugar crystals, spruce, fir, a medley of soft woods, sandalwood, oud, cedar, patchouli, guaiacwood, bayberry, mistletoe and a touch of amber. This complex and unique blend will take you on a morphing adventure. On cold sniff and initial application, you'll be greeted with evergreen and bayberry top notes and loads of sugar-encrusted musky/earthy woods. The dry down is a warm, sweet and comforting blend with a tiny wisp of sweet hearth smoke. The green notes are very faint at this stage. A base of deep sugared-patchouli and musky cedar is prominent. 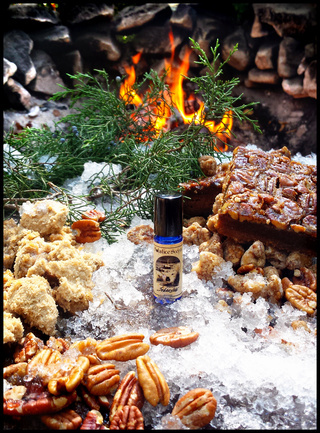 It is festive and woodsy though not as literal as some of our other woodsy fragrances. It is very sweet, woody and musky all at once with coniferous undertones. Unisex. Despite the evergreens and woods used, this is a very gentle blend of soft woods as opposed to a dark, heavy, woodsy blend. The sugar keeps it light-hearted and the other notes bring a festive winter impression to mind. Outpost is very fun to journey with when you're outside on a cold day. Cool weather really brings the notes of Outpost to life and enhances the blend. 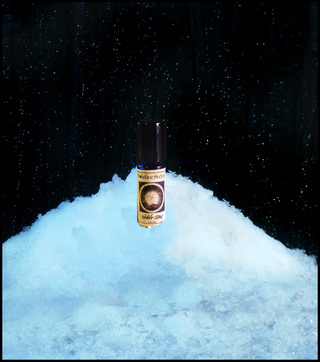 Snowmint Mallow is subtle yet sweet and cakey blend featuring cool creamy peppermint, vanilla cake, white flaked coconut, fresh baked cookies and a dollop of marshmallow creme.On cold sniff and initial application, each of the notes are detectable with the peppermint floating on the top. The peppermint is a top note and therefore its presence is short lived. Snowmint Mallow quickly evolves into a gourmand delight of mouthwatering fluffy vanilla cake, sugar cookies, coconut and mallow. Past initial application, Snowmint Mallow snuggles in close to the skin. Whiffs of coconut, cookies and cake will be had occasionally but since this fragrance wears closer in your aura, it makes for a perfect subtle sweet scent for the workplace or for when you'd like to smell good but not too heavy. It also makes for a really cozy and comforting fragrance to wear just before bed. This heavenly fluffy foody fragrance is especially recommended to those who love cake and cookie scents. 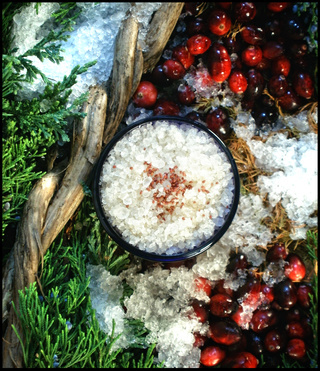 Tart plump sugared cranberries with a whimsical wisp of spice in the background and festive green Spruce Essential Oil combine to bring a very wintery holiday blend to you this year. A unique fragrance to enhance your Winter Season. Smells like a coniferous cranberry juice! Winslow's is the scent of winter. Fir, woods, bayberry and mistletoe meld with spicy clove and blood orange essential oil and the result smells effectively like bottled winter. Winslow's contains fir absolute and essential oil, spruce EO, cedar, a touch of guaiacwood and a blend of several fragrance oils in addition to the bayberry, mistletoe, clove and blood orange. 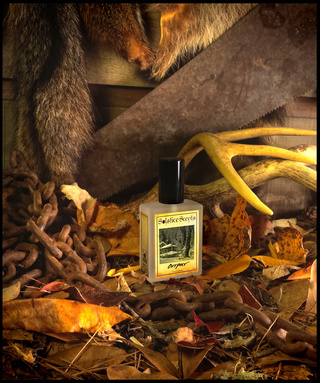 If you enjoy evergreen and/or woods scents make sure to try Winslow's. 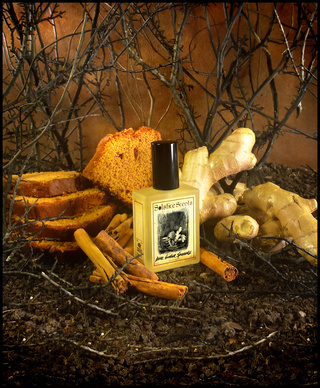 The combination of bayberry and clove gives the impression of a Victorian Christmas. Unisex. Endangered perfume alert: The last of our Master Bedroom perfume oil is currently on our site. This perfume is no longer available in sample format. We can no longer source one of the important notes in this fragrance and there are only about 5 bottles left. I expect these will sell well ahead of the Winter Collection release. Maine Moon, Shadows in the Night, Whispers in the Night and Fires in the Night will be on hiatus for a while due to low sales. There are a couple of bottles of Maine Moon left on our site at present. In early 2017 we will be taking away a few more of our lower sellers and retiring them for a bit in an effort to make room for new perfumes to join our catalog. The Rhinestone Housewife will be carrying our winter 60 ml EDPs and perfumes. If you're an international customer interested in 60 ml EDPs, this is where you will go to purchase them as we do not ship the 60 mls internationally. She has a few bottles of Master Bedroom and Maine Moon 5 ml perfumes left. Femme Fatale Cosmetics Australia has listed our fall collection and the winter collection will be on their site in a few weeks. They also currently have perfumes that we do not have in stock: Cameo, Chiffon, Blossom Jam Teacakes (all from our spring line), Rose Leather and Vanilla Pipe Tobacco. They have a few bottles of Master Bedroom 5 ml left.